Many moons ago, the mid-'90s to be exact, I started collecting the Don Post replica Star Wars helmets. They weren't readily available in the UK and so I ended up buying a Stormtrooper, Darth Vader and Tie Fighter Pilot helmet from the USA. Eventually I decided that I wanted more authentic show pieces, but they were too expensive, so I got rid of the Don Post helmets with an aim to save up and buy more impressive replicas. Sadly I never did get around to looking out for good quality fibreglass versions (although I did pick up a fan-made Emperor's Royal Guard - mainly because they weren't being produced in any large numbers elsewhere). Then I saw for Christmas 2016, Hasbro were going to be releasing a Black Series Stormtrooper helmet with a voice changing feature. I pre ordered one online months before the release date only to be notified, just before they went on sale, that unfortunately that particular store wouldn't be getting any after all. As it turns out the reviews were pretty damning of the poor microphone and speaker quality, so I saved myself £80. 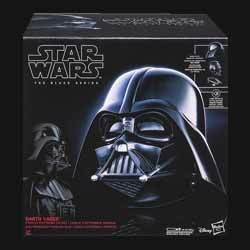 So, when I saw that a Darth Vader helmet was being released in The Black Series I was looking forward to seeing what Hasbro delivered. In truth, it's a good helmet but not really a collector's item as some may have hoped. Firstly the plus points. It's pretty cheap considering that it comes in four pieces that provide a good, strong seal around the users head, as well as producing a number of sound effects. It's extremely detailed, both inside and out, and allows the wearer to don the entire helmet or just the neck brace, like Anakin Skywalker does at the end of Return of the Jedi. There's even a piece of plastic included that can be used as a base so that the helmet stands firm when on display. On the down side. It's not really a movie accurate show piece (but then for the price you shouldn't expect that). You'll need to wear gloves when putting it on if you don't want to go through the hassle of getting someone to wipe it clean afterwards. As shiny and cool as this looks, it's pretty easy to get it smeared up with fingerprints - and when you do it looks awful. The electronic effects are, sad to say, pretty pointless. When the magnets seal the helmet shut it makes a noise, when you disconnect the helmet it makes another noise. Then there are two breathing sounds - one for when the neck brace is detached from the helmet (a sort of wheezing mechanical breathing) and the standard Vader breathing when the helmet is all put together. However the breathing only lasts for a few seconds once you press a button on the side of the helmet, so if you want to have Vader constantly breathing as you walk around, you'll need to keep pressing the button. I was expecting a voice changer too, but that's not included - which seemed a little strange. I suppose that the amount of sweat that you produce, not to mention fogging up of the inside by breathing, would probably have destroyed a microphone in weeks. It's also a little small. I'm 6ft, 4in. and a little bulky. I had no problem putting the neck brace on, nor the faceplate. But trying to get the faceplate and neckpiece to click together (via the magnets built into the helmet) was a lot of trial and error and I was worried about pinching my ears or my neck fat, because when those magnets clip together they are well and truly sealed. In fact, I had a minor panic attack when I couldn't get the damn thing off on the first try. It wouldn't have been so bad if there had been some movement within the helmet, but my fat face was squashed inside. To be fair the tight fit helped make it easier to see out of the smoked plastic lenses. The detailing of the helmet is impressive - especially the inside - and helps to give it a premium feel. While it is incredible value for money I was disappointed that a voice changer element hadn't been incorporated. If you can keep it clean, and free from greasy fingerprints, this also looks impressive as a display piece. 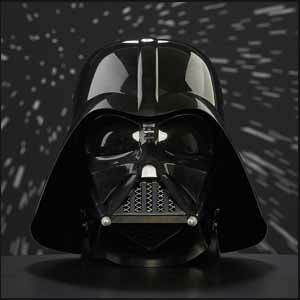 Overall a great piece for those wanting a Vader helmet that looks the business, but at a very reasonable price.